COLUMBIA, Mo. – Membrane proteins are the “gatekeepers” that allow information and molecules to pass into and out of a cell. Until recently, the microscopic study of these complex proteins has been restricted due to limitations of “force microscopes” that are available to researchers and the one-dimensional results these microscopes reveal. Now, researchers at the University of Missouri have developed a three-dimensional microscope that will yield unparalleled study of membrane proteins and how they interact on the cellular level. These microscopes could help pharmaceutical companies bring drugs to market faster. “Force microscopes are very different from the microscopes we used in biology class,” said Gavin King, assistant professor of physics and astronomy in the College of Arts & Science at MU, and joint assistant professor of biochemistry. “Instead of using optics, force microscopes incorporate a tiny needle that gets dragged across the surface of the slide or specimen, similar to how a blind person reads Braille or comparable to the needle of an old record player. However, the one-dimensional, traditional method of studying membrane proteins through a force microscope—while good—only yields limited results,” King said. Normally, force microscopes measure the compression of the needle against the specimen by bouncing a single laser off the cantilever, or arm, that holds the microscopic needle in place. As the cantilever moves, it deflects light that is sent back to a highly advanced computer. There, the results are interpreted, giving researchers an idea of how the membrane proteins are interacting with the cell. Usually, to determine membrane protein structure in detail, specimens must be crystallized, or frozen; therefore, the specimen cannot be studied as it would behave in the primarily liquid environment found in the body. King and his fellow researcher, Krishna Sigdel, a postdoctoral fellow in the Department of Physics, solved the problem by building their own force microscope that is able to study membrane proteins in conditions similar to those found in the body. Using a traditional one-dimensional force microscope as a guide, the team added an additional laser that measures the second and third dimensions of tip movement, giving researchers “real-time” access to the measurement of peaks and valleys in the membrane protein and dynamic changes in those structures. King suggested that an advantage of three-dimensional force microscopy is that it allows for better interpretation of how a protein’s dynamic shape also dictates its function. King said that by studying how the shape of proteins change, researchers can determine how drugs bind and interact with cells. Using membrane protein information, pharmaceutical companies can determine which molecules to pursue. King’s work, “Three-dimensional atomic force microscopy: interaction force vector by direct observation of tip trajectory,” was published in NanoLetters, the journal of the American Chemical Society and was funded in part by the National Science Foundation and the Burroughs Wellcome Fund. The publication was co-written by King, Sigdel and Justin Grayer, who is currently a graduate student in MU’s Electrical and Computer Engineering Department. 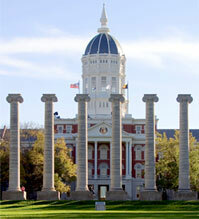 King’s joint appointment in the Department of Biochemistry, which is located in the School of Medicine and the College of Agriculture, Food, and Natural Resources, emphasizes the highly collaborative culture in the area of One Health/One Medicine—one of the four key areas of collaborative strength that distinguish MU collectively known as the Mizzou Advantage. The other three areas are Food for the Future, Sustainable Energy, and Media of the Future.